The Bribr.org website offers citizens a new way to confess to bribery anonymously. According to its creators, the website serves as a reminder to Russians that officials are not the only ones to blame for bribery. The Bribr team hopes that the project will help make society less accepting of corruption. A new website called Bribr – a mobile application that collects information on bribery – appeared online in early October. The stated goal of the project is to fight petty day-to-day bribery, rather than expose big-time corruption. Developers claim the website is apolitical. On the Bribr website, users can download the application to their iPhone and anonymously confess to paying a bribe – for example, after being pulled over for drunk driving. Users can specify the amount, location and category of the bribe given. According to statistics posted on the Bribr.org website at the time of writing, the total amount of bribes “disclosed” since Sept. 24 stood at 144,000 rubles ($4,620). Nearly half of this amount (52.5 percent) ended up in the pockets of State Traffic Safety Inspectorate police officers. Much of the website’s user interface is taken up by a map that pinpoints the locations of where bribes have been paid. “Corruption has become the number one problem in Russia, but people tend to place the blame on top officials, rather than on themselves,” said Yevgenia Kuida, editor-in-chief of Afisha magazine and founder of the Bribr project. Besides the I Paid a Bribe website from India, the creators of bribr.ru were inspired by The Economist’s Big Mac Index project, which aims to present average data, rather than precise data. The Big Mac Index is based on the theory of purchasing-power parity: in the long run, exchange rates should adjust to equal the price of a specific product. By comparing the price of a Big Mac in different countries with the average price in America, The Economist claimed, for example, that the Swiss franc was 62 percent overvalued. The Bribr team acknowledged that there is no way to guarantee the authenticity of each report; they must rely instead on the responsible behavior of their users. All input is pre-moderated, with absurd claims dismissed on the basis of common sense, and spam texting from single phone numbers blocked. “We are not claiming 100 percent accuracy. It is all about spreading the word and promoting responsibility through a game,” Kuida said. The creators of the project intend to take the idea of intolerance to petty corruption offline too. They have printed wads of zero-ruble banknotes – also downloadable from the website – that can be used to bribe a traffic cop or to hang at the office for everyone to see. Apps are being developed for Nokia and Android smartphones, and negotiations for project support are underway with the Russian office of Transparency International’s anti-corruption research and initiative center. iLabs attempted to launch the Rosvzyatka iPhone app a year ago, based on exactly the same principle as Bribr’s. Users would download the app, click on the double-headed eagle icon, and list the location and amount of a given bribe, after selecting an appropriate category. The data would then be mapped. The developer, Georgy Rozhko, reported that the app is currently not functioning, because “there’s a lot of other stuff going on.” A similar project, Roskomvzyatka, began in March 2011. Users can report bribes and map them, while the server simultaneously monitors corruption news from open sources. 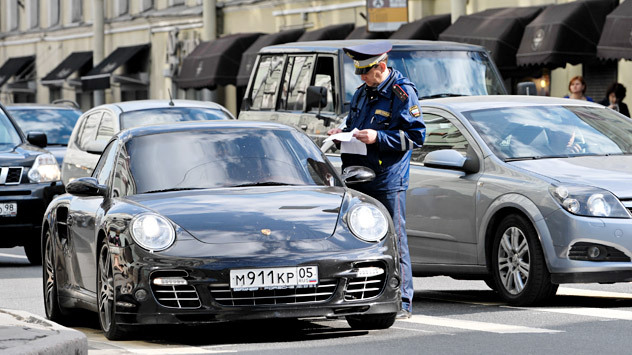 More than 2 million rubles ($64,100) in bribes have been reported so far. The Rospil anti-corruption project – the brainchild of Alexei Navalny – has its own beef with Bribr. “For some reason, its developers are refusing to record large bribes, and these can be game changers. This significantly distorts the whole picture. The huge size of Russia’s industrial, large-scale corruption will be hidden behind petty routine bribery,” said Rospil’s legal counsel, Andrei Mishchenkov.